This trail is for sure the longest singletrack trail I have ever ridden. 85 kilometers, built for mountain bikes in particular, in just one piece, only with a flight of stairs in the middle that are better done off the bike. The landscape is spectacular as it offers everything, the lush, subtropical west coast of New Zealand‘s South Island has to offer. The trail project was made possible only with huge investments and the funding from government, private donations and lots of volunteer work. Hundreds of thousands hours of paid and unpaid labor went into the construction works from the start in 2010 to the finalization by the end of 2016. The Old Ghost Road Trail is open for both hikers and mountain bikers, so trail etiquette is a must. The 5 huts on the way must be booked in advance but give you the choice between multiple day rides. However, you could do the 85 kilometers in one stretch, but then you wouldn’t find the time to really enjoy it all. I started my ride from Lyell (which is the better direction for bikers) to begin with the long climb to Lyell Saddle. I actually enjoyed the 25 kilometers uphill, thanks to the mostly moderate incline, the pristine nature and awesome views and lastly thanks to nice and entertaining company. Riding along the Lyell Range and passing Heavens Door the stunning views compete with the necessity to keep the eyes on the exposed trail. From Ghost Lake Hut the more technical and fun part starts when the trail winds down on series of switchbacks and drops before it turns into a fast and furious fun ride that spits you out at Stern Valley Hut where I booked my overnight stay. I enjoyed the basic accommodation in the hut after a cleaning swim in the cold creek and spotting a rare blue duck. If there just were not that many sandflies… Nonetheless, I love these overnight stays in huts where you meet a dozen of strangers and leave the next morning with a dozen of acquaintances. From Stern Valley there is one more climb before the trails runs alongside the Goat Creek crossing several bridges until it meets the Mokihinui River. At Specimen Point Hut you first look down the gorge on the roaring river, then you ride the next 17 kilometers mostly on the edge of this gorge. Breathtaking. The trail ends near Seddonville, from where get shuttled back to your car at Lyell, if you had booked it accordingly. Altogether the Old Ghost Road Trail is a unique epic trail ride. 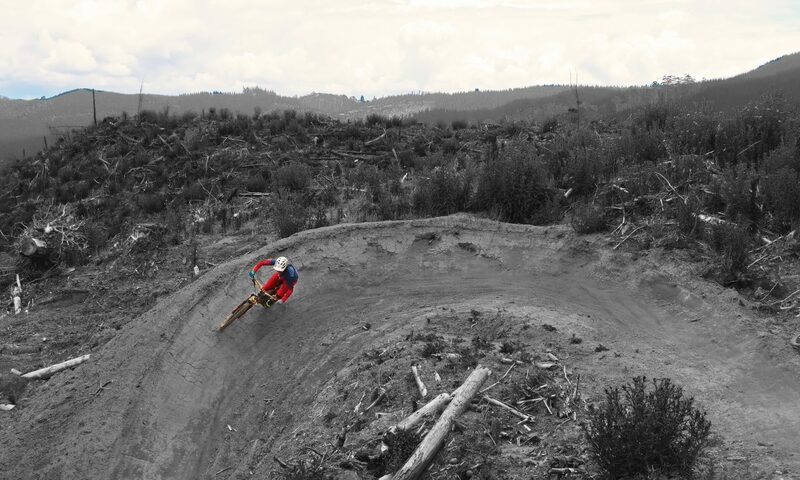 A must-ride in NZ!